I promised myself a long time ago that I will do 3 recipes from every Hannah Swensen murder mystery book (by Joanne Fluke). I have tested a lot of recipes from these books, I would say 1/3, but I just haven’t had the time to write them down yet! Here is my third recipe from the Red Velvet Cupcake Murder. Place the white and brown sugar in the bowl of an electric mixer. Beat them together. Add the softened butter and mix in on medium speed. Beat until light and fluffy. Mix in eggs, one at a time, beating after each addition. Add the vanilla extract and strong coffee. Mix. Then add instant coffee, salt and baking powder. Blend well. Mix in the flour a half cup at a time, beating after each addition. Then add white chocolate chips by hand. 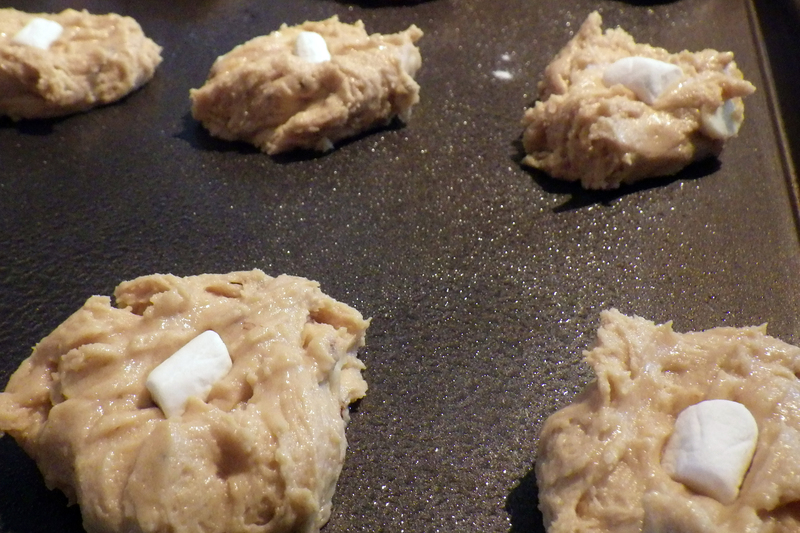 Drop spoonfuls of dough onto greased cookie sheets, 12 to a standard sheet. Press your impeccably clean thumb into the center of each dough mound. Fill the resulting indentation with a white miniature marshmallow. Press it down slightly. Bake the cookies at preheated oven, 350 degrees F for 10-12 minutes or until nicely browned. Makes approx 4 to 5 dozen cookies, depending on cookie size. 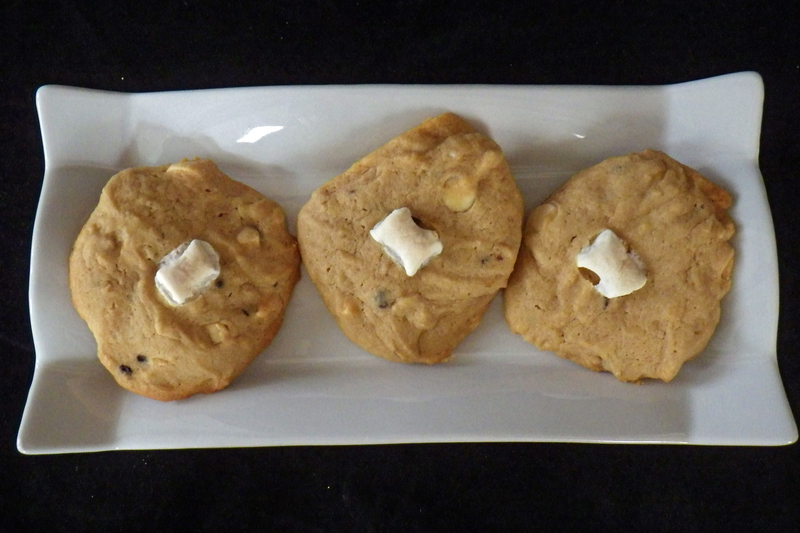 Some of the cookies I made with 1 marshmallow and some I did with 2, honestly next time I would just use a big marshmallow, tastes really awesome. If you’re a big Hannah fan as well give me a shout! *Note from Feb 10th: If you don´t like brown marshmallows on top (after baking), put them on when you take them out of the oven! Hi Elaine! Thank you for visiting our blog and trying out these cookies. I hope you enjoyed them despite the fact the marshmallows browned. As for your question. I’m not really sure why mine weren’t browned. I used mini marshmallows that you buy in a bottle for your hot chocolate and they were not the freshest and had a little harder coat on them. Maybe that’s why? The recipe called for miniature ones and that’s all I had on hand at the time. Hmm. These were interesting. Awfully sweet and the marshmallow made uneven brown splats. To counter the sweet, I dusted with cinnamon after cooking. I think I would like more coffee flavor, less sweet white chocolate, etc. Perhaps another recipe altogether. I think I will try some brown chocolate and maybe figure out another idea for a white “marshmallow” icing. It’s a great concept, though. I agree, Carolyn that most of the Hannah Swensen cookies (recipes) are very sweet and I have even put less sugar into some. Interesting is the word I would use too but after all I did like them. If you are a fan of chocolate I would recommend https://torontocooks.com/2013/12/12/sinco-de-cocoa-cookies/ this recipe. I love them because of the very strong chocolate taste! Thank you. I looked at that link and it looks like a great, fun recipe. I’m also interested in the concept of adding something hot/spicy to chocolate, like the brownie cookies, also from the same Swenson book. Have you tried those? If not, I will have to take a leap of faith and use the canned, chopped peppers. Normally, I would probably use a pinch of cayenne for the heat. The spicy brownies sound great, unfortunately I´m allergic to peppers so I can never try it! I guess you are a fan of Hannah Swensen books as well? My absolute favourite is Easy Cheesy Biscuits recipe. What else have you tried? The Red Velvet book was my first and the coffee and cream cookies were my only try so far. Today I’ll try the really hot brownie cookies and let you know.